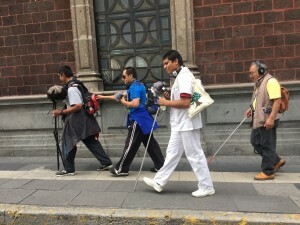 A group of blind and visually impaired people chose the sounds of the audible pedestrian signals in Madero street. Globalized cities have lost their specific sounds: cities have grown into a low and continuous whispering made from traffic, engines and machines gathered everywhere. Yet, new sounds appear in the cities, deliberately and abruptly introduced in public space: subway closing door signals, loudspeakers voice announcements and, particularly, audible pedestrian signals for blind people. How can citizens make an impact on transforming the sounds that define their environment? 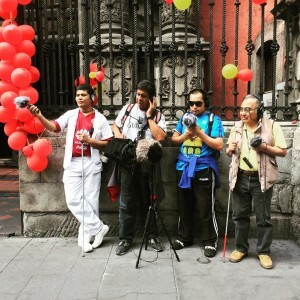 Semáforos sonoros is a project made in collaboration with a group of students from the Escuela National para Ciegos (National School for Blind People) who intervene the sound devices in audible pedestrian signals with sounds chosen and processed by themselves. This was a result of a workshop during which field recording lead to the registration and design of the chosen sounds. All participants practiced their creative thinking and technical learning abilities within the sound art field, using a variety of microphone and recording techniques that allowed them to synthesize and create a more appropriate and accessible sonic cartography, through which the difficulties and barriers they face while moving around the city are exposed. On one hand, to generate a calling up in considering other possibilities of experiencing public space, by making clear the right to the city of the blind community. On the other hand, to give the visually impaired and blind people group the opportunity to express their sound perceptions of the city, by assuming public space as their own. The exhibition “Un Mundo en Común“ shows some process registration and one of the auditory signals loudspeakers is displayed, so the public in the museum has the chance to experience the result of the exercise realized in the pedestrian streets of Centro Histórico. In parallel, the installation Ciudad(es) Invisible(s) is presented as an extension of the workshop, proposing a sound experience in the darkness. 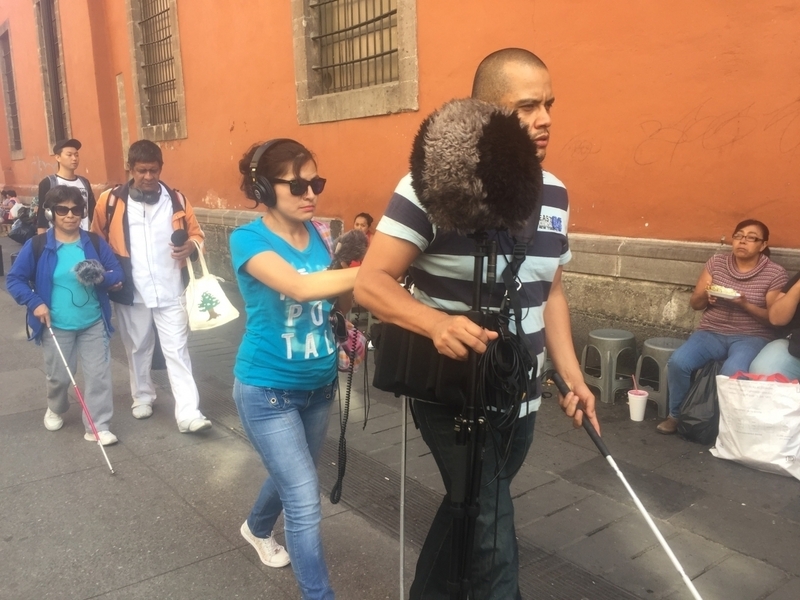 On November 12th soundwalks guided by the participants in the workshop took place, aiming to induce the public into a blind experience of the city. On 9th and 10th November, the radio program ENC Radio, presented by some of the workshop participants, was live broadcast during the “Un Mundo en Común” Encounter. The exhibition “Un Mundo En Común“ is presented in Ex Teresa Arte Actual from 9th to 19th November 2016. With the participation of: Abigail Maite Zavala Rosas, Alejandro Amado Romualdo, Esau Daniel Montes Cornelio, Ismael Vivero Monroy, Joel Oliva, Maricarmen Grau, Miguel Ángel Nava Jiménez, Monica Crisostomo Moctezuma, Octavio Baez Salgado, Pedro Waldo López, Ruben Álvarez Trejo. In collaboration with: Cecilia Sanchez Nava, Ricardo Angeles Reyes y Vania Rocha. With the support of: Autoridad del Centro Histórico, INDEPEDI, SEMOVI, Seguridad Pública, Escuela Nacional para Ciegos.